SATENTEK, with its high adherence, is a finishing plaster used as an undercoat for all types of paintings. Long workability time enables an easy application with low waste rate. 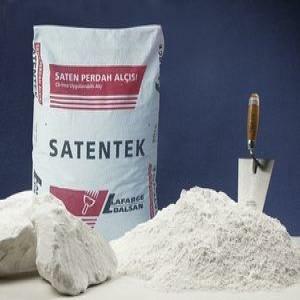 Special additives in its formulation delay the absorption of SATENTEK mortar’s water by the substrate. SATENTEK is a paste-like. It is easy to apply. Special grain-size distribution yields hard and smooth surfaces. Put some water in a clean bowl. Sprinkle SATENTEK until cover it covers the water surface. Wait for a few minutes, then mix the mortar until a homogeneous mixture is achieved. After mixing, the mortar is ready to use. The mortar in the bowl can be used for approximately 1 hour. For the application, use plaster trowel and steel spatula. Scrape off the residues after they set. Never mix SATENTEK with any other product or material. Do not add any water or plaster to the mortar after mixing. Using SATENTEK within one year after the date of production is recommended. Poor or over-long storage may deteriorate the physical properties of SATENTEK.